You may have heard that the Bible has been translated and retranslated so many times that we can’t possibly know what the original version said. Or you may have heard that early Christians purposefully changed the Biblical text to suit their purposes. The assumption is that error has crept into the text over time, changing the original message. Can we really know how much the Bible has changed over the centuries? Can we be certain that what we read in the New Testament is the original eyewitness account of Jesus? Thanks to the science of textual criticism, which is used to test the accuracy of every ancient manuscript (including Homer, Shakespeare, Aristotle and more) we can know exactly how much the Bible has changed over time. Read on to find out more, and to learn how to teach this concept to your kids through a simple activity. According to Encyclopedia Britannica, textual criticism is: “the technique of restoring texts as nearly as possible to their original form”. The basic rule of textual criticism is the more the merrier and the older the better. The more, then merrier. The more copies, particularly old copies, of a document that you have, the more easily you can tell what the original text was. This is because you can compare the copies with each other. One copy may contain a mistake; but all of the copies will not contain the same mistake. We have over 24,000 partial and complete New Testament manuscript portions to compare with each other – by far the most of any work of antiquity. Homer’s Iliad has the second highest number of ancient manuscripts still in existence to use for comparison – but we only have 643 copies of it. You can see by these numbers that it will be quite a bit easier to establish the original text of the New Testament documents than that of any other book of antiquity. The older, the better. The older your surviving manuscripts are, the closer they are to the original. It goes without saying that the older your document is, the better it will reflect the original thinking and teaching of the original document in question. We have an entire New Testament dating from 225 years of the original writing; full books from 100 years of the original and fragments from about 50 years from the original. That may sound like a large time gap, but the Iliad – again the next runner up – has a gap of 400 years between existing manuscripts and original writing. Most books of antiquity have a time gap of about 1,000 years. Here’s the upshot: if we can’t have confidence that we have the original text of the New Testament, then we can’t suggest that we have the original text of any books of antiquity – and no one holds this opinion. One more thing to note. When scholars create a new translation of the New Testament documents they do not solely consult the most recent translations to create their new edition. They also consult the oldest surviving manuscripts as well. This is a check to make sure that original text and meanings are accurately preserved. 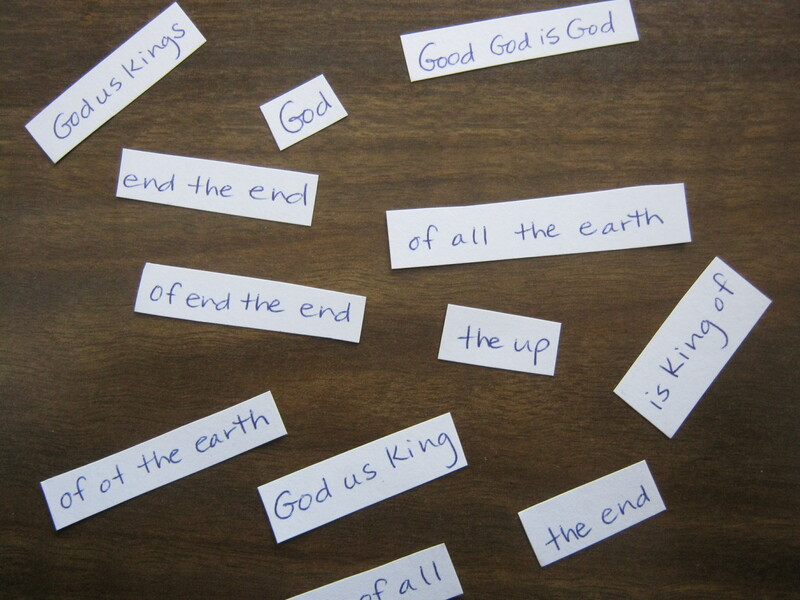 Here’s an activity to help your children to understand the concept of how textual criticism works to establish that we have the original words of the New Testament. Select a passage of text – either a passage of scripture that is unfamiliar to your children, or something else (it could even be a personal message such as: ‘Hi cutie, you are so smart and I think you’re awesome!’). Examples of what I used for this activity are at the end of this post. Copy this passage out ten times, deliberately making mistakes to each copy (misspell a word, omit a word, add a word, change a word, etc.). I put each passage on to a different slip of paper to emphasize that they were different copies of the same passage. Tell your kids that you are trying to figure out what the original message said, but that each of the papers has a slightly different version of the message. Tell them that they need to compare the sentences (work word by word) to figure out what the real message is. Provide them with a blank piece of paper to write what they think the original message was, reconstructed from the copies provided. Working word by word, your child should be able to quickly determine which words are most common between the slips of paper and decipher what the original message was. If the word appears on all of the slips of paper (all copies of the text), then it was in the original. If the word is in none of the sentences, then it wasn’t in the original. If it is in most of the sentences, it was mostly likely in the original. If you use a passage from the Bible, have them confirm their work by looking it up in the Bible. Explain to your kids that the process they went through to figure out their message is very similar to how scientists figure out if we have the original words of the disciples and Jesus in our Bible, or if the message of the Bible has changed over time. But instead of having ten copies of the message, we have thousands of copies to compare with each other. We know with a lot of confidence that the Bible we have in our hands has the same message as the documents and letters that the first churches received from the apostles. Copied below is the text we used for our kids when we did this activity. In retrospect, we found that we could have used longer verses. ← Who Decided Which Books to Include in the Bible? An absolutely awesome lesson for our kids. Thank you SO much for taking the time to write out what you did. Awesome. Thanks so much for this. Truly awesome to know our faith is not just a fairy tale, but is based on solid evidence and facts. God bless.